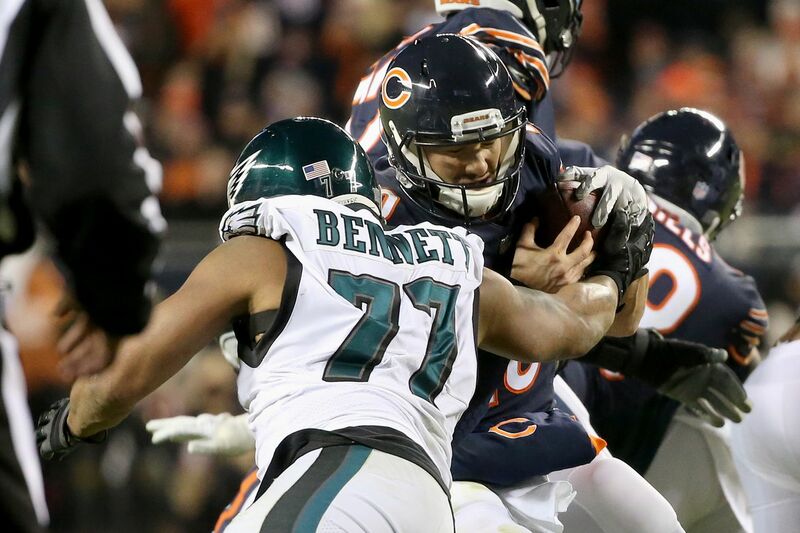 Michael Bennett sacks Bears quarterback Mitchell Trubisky during the Eagles' win on Sunday. The Eagles beat the Bears, 16-15, to advance to the next round of the NFL playoffs. Paul Domowitch offers up his grades. See what he has to say and tell us what you think. With the exception of a pair of 10-yard runs in the first half by Darren Sproles and Wendell Smallwood, the Eagles weren’t very effective on the ground against one of the league’s best run defenses, averaging just 1.8 yards per carry. They had just two rushing first downs. But they ran it enough – 23 times – to keep the Bears honest and give some teeth to the play-action game. Nick Foles threw a pair of first-half interceptions in Bears territory that killed potential scoring drives. But he completed six of nine passes on the Eagles’ game-winning drive, including the 2-yard touchdown to Golden Tate. Tate had a big game, catching five passes, three on third down and the game-winning TD on fourth down. The Eagles’ offensive line did a good job of protecting Foles, limiting the pressure on him. NIck Foles has the highest career postseason passer rating among quarterbacks who have made at least 150 attempts. The Eagles did a good job of neutralizing running backs Jordan Howard and Tarik Cohen, holding them to 35 yards on 11 carries. They also were effective in limiting QB Mitchell Trubisky’s rushing opportunities. Trubisky finished with nine yards on three carries. Rookie cornerback Avonte Maddox got burned a couple of times by Bears wide receiver Allen Robinson, giving up a 45-yard completion on a double move late in the third quarter that set up a Cody Parkey field goal, and later a 22-yard touchdown that put the Bears ahead. Robinson also had a 25-yard catch on the Bears’ last drive. But for the better part of three quarters, the Eagles did a good job on Trubisky. 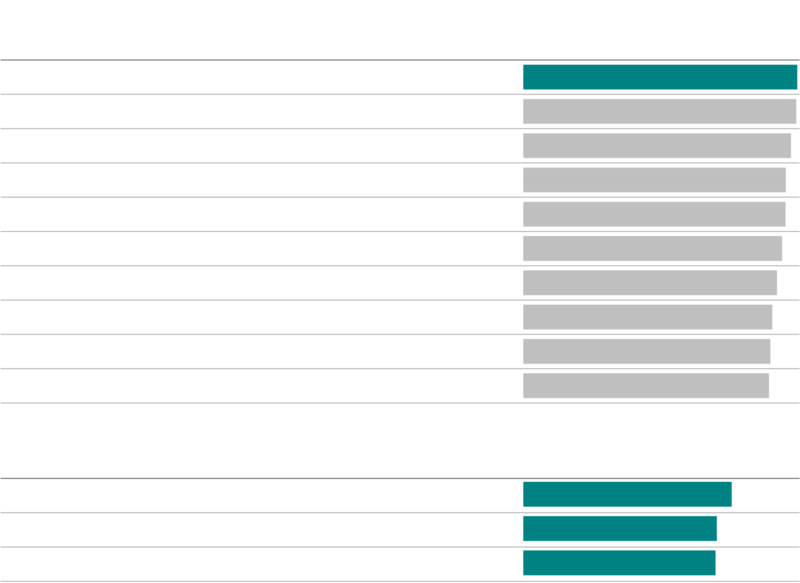 The Bears had the worst kickoff return average in the league this season. But the Eagles gave up a near fatal 35-yard return to Tarik Cohen late in the game. Cameron Johnston did a good job of keeping the ball away from Cohen on punts. Jake Elliott made his only field goal attempt, a 43-yarder that gave the Eagles an early lead. Trevyon Hester saved the season by tipping Cody Parkey’s game-winning field goal. But for the grace of Treyvon Hester, the Eagles’ season would be over right now. But everybody needs luck occasionally. Nick Foles threw a pair of interceptions and the ground game averaged 1.8 yards per carry. But the defense held the Bears to five third-down conversions in 16 tries, and Foles led a crucial game-winning drive on the road against one of the league’s best defenses.